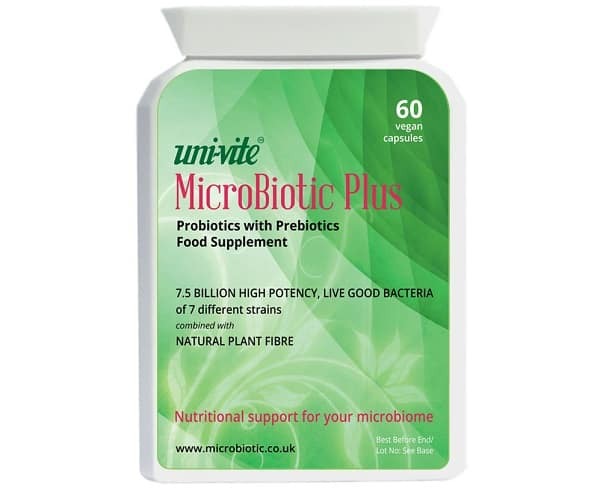 How does MicroBiotic Plus compare with conventional supplements and yoghurts? Hardy endospore strain Bacillus coagulans ProDURA? With PREbiotic plant fibres too? Convenient recyclable packaging for continued freshness and easy portability? Resistant strain Lactobacillus acidophilus DDS-1? Hard-shell vege-capsules for delayed absorption? Human-origin strains, so adapt naturally? Variety of different probiotic strains? Very few have resistant strains and usually only a maximum of 2 strains. Stable at room temperature, so can take while travelling? 7.5 billion CFUs of probiotics per serving? Check labels. Over 5 billion, variety is more important than sheer number. Vegan ie. NO animal products? Money-back guarantee from established UK company?